DETROIT - Aug. 15, 2018 - PRLog -- Sowing Empowerment and Economic Development, Inc. (SEED), is hosting the 1stAnnual MotoFest Ride & Festival, a coordinated 32-mile motorcycle ride thru beautiful Detroit followed by an afternoon festival of food trucks, vendors and community organizations. The festival will offer pavilions to enjoy and explore: community and county services and educational opportunities for the surrounding areas. Since 2014, SEED has served more than 1,000 Detroit metro residents annually through the provision of emergency food, summer enrichment, financial literacy and housing counseling. Proceeds from the event will allow the organization to continue to fulfill our mission to provide food, clothing, education and training while promoting self-sufficiency and empowerment directly to low- to moderate-income families and communities. "We are excited to celebrate the great work SEED is doing in the Detroit area while bringing attention to the important needs many in our communities still face," said Nichole Mattison, SEED Vice President of Programs. "Our partners have answered the call to create awareness about the need for more after school and summer enrichment, housing counseling and financial capability training for our most vulnerable residents and we're encouraging more to join us." Axemen Motorcycle Club and Wolverine Harley Davidson are joining the community nonprofit as sponsors for Motofest 2018. The event will begin at the dealership located in Clinton Township ending with a festival including live music, vendors, community services, food trucks and entertainment at the Axemen Motorcycle Club located on South Street. Proceeds from this great day will go towards funding the organization's continued work on behalf of low to moderate income families in Detroit. 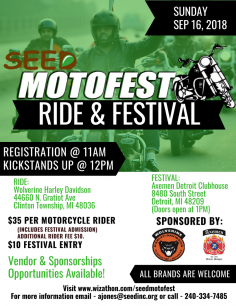 "Axemen Motorcycle Club is proud to partner with SEED for the first MotoFest Ride and Festival here in Detroit" said Darrell McLaurin, President of Axemen Motorcycle Club. "Looking at the long history of our organization, it's events like this that cement our commitment to building stronger communities, contributing to impactful civic engagement initiatives, and creating inclusive ridership at every opportunity." Since 2014, SEED has had a tremendous impact on the Detroit community through housing counseling and education for dozens of recipients of the Housing Choice Voucher Program, helping them reach the dream of homeownership. SEED continues to provide food, clothing, education and training while promoting self-sufficiency and empowerment directly to low- to moderate-income families and communities. The organization also provides emergency food and has served more than 150 scholars through the SEED-CDF Freedom School and SEED Summer Bridge Enrichment Program. "Wolverine Harley-Davidson in Clinton Twp. is really proud to be chosen as the official start location of the MotoFest Ride and Festival," says Carla Carlson, Event and Marketing Manager. "We offer a variety of Motorcycling opportunities for our visitors to partake and we are happy to partner with SEED to help build better communities." Riders and festival-goers are encouraged to register in advance. Registration starts at $35 per motorcyclist which includes ride fee and festival entry. Festival-goers registration is $10 per entry at the Axemen Motorcycle Club, 8480 South St, Detroit, MI, 48209. More details about MotoFest Ride and Festival are available online at http://www.wizathon.com/motofest. For media inquiries, please contact Avery Jones at ajones@seedinc.org. : Sowing Empowerment and Economic Development, Inc.